Turtle Moon Studios. Susan Shie. Turtle Trax 9-19-00 page 1. A Very Cool and Colorful Summer! Here are the bright and floaty tall Cosmos flowers that grew from last year's seeds at the end of our driveway. This is page one of this month's diary. If you like, skip to page two of this month's diary. Topics in this diary: New washer! CraftSummer class, July Tarot Art Camp, our solo show at Fitton Center, Snyder ice cream supper, August Turtle Art Camp, the garden, our Chicago class, Mom, Gretchen and Mike's wedding prep, upcoming Atlanta class, our art. It really was cool here in Ohio this summer, and though the tomatoes and peppers didn't like it very much, we sure did! We don't like using our air conditioning unless the weather gets hot and humid, as we prefer to hear the birds and bugs outside and to feel the nice breezes! We got a lot of nights this summer when going to bed sounded a lot like lying in a tent, listening to the crickets and tree frogs out in the back yard. Windows flung open wide!!! Ah! And happily, the flowers all thrived on the cooler weather, blooming in huge mounds of delight! Jimmy tried to talk me into buying the new Maytag Neptune, front loading washing machine before he went to Grayling, MI, to fly fish in late June! I knew he was trying to do something very nice for me, seeing as how he was splitting for almost a week, but my Mennonite roots refused to dump the 30 year old Maytag yet. It was still working, sort of. It had a couple of things wrong with it, but we could still wash clothes with it! You can't imagine, but it's honestly FUN to wash clothes now! This front loader will let you pack clothes right up to the top, lightly packed that is, and it uses way less water than other washers! You can get a sleeping bag or comforter into it!!!! I do the happy washerwoman dance every time! And look again at that picture! Such a nice Maytag man! And see the garden back in late June, just starting to come up! Wait til you see it in Sept, later on in the diary! Anyhow, we be washin' fools now!!!!! Oh, and we already got the new dryer in January, when the old dryer kicked the bucket! So NOW, if you come to camp here, we'll let you touch our new washer and dryer, and we'll even do a load for you during the week! So after washing everything in sight, we set off to teach "Diary Painted Chairs" at CraftSummer, the summer art program of Miami University in Oxford, Ohio. Above are our happy tribe of wild students, who are modelling their airbrushed tee shirts, custom made by all of us for this class. (Except for Lori and Jimmy, who just had to be rebels!) Yes, they made me lay on that table like some glamourpuss, but I look more like a beanbag chair! This picture musta been taken near the end of the week, because Kathy Grimm, of Cincinnati, has the glow-in-the-dark aliens already glued onto the lower rung of her chair. It was made for her little daughter, who loves to sit in the closet with her mom, listening to stories and savoring glow-in-the-dark toys! When we had the last day Walkabout, that little kid raced up to the alien chair and yelled, "MINE!!!!!" The idea of this class was to bring an old chair in good shape, and to sand, prime, paint, and varnish it in our five day class, as well as to make anything out of fabric and / or embellishments to add. Here is Jimmy and my last chair in a set of six Kitchen Diary Chairs. We'd saved this one for last, since it had needed repairs to its arms. It was the fancy one, the Captain's Chair. Doing my usual diary writing and drawing on it in class, I slowly bent its theme from Rita our white cat to Gretchen and Mike's wedding, since that was and is big on my mind! Soon here was this gorgeous purple Gretchen and Mike chair, but Jimmy said, No, I couldn't give it to them, since it goes with our Kitchen set. Well, its arms won't fit under our table, so I have talked him into giving it to Gretchen and Mike after all! I mean, come on! This chair is really about them, though the diary parts include all kind of non-wedding stuff, like Jimmy's plugged ear and how hot it was at Miami U! The students all worked really hard and made wonderful chairs, too, and I'm being very evil, just showing you ours, but look at the back! It's Gretchen as the Big Shoe Bride! Later in the diary you'll see the shoes I had to paint up for her, in order to get them to work with her dress! At this point, I had the shoes and was getting up my nerve to paint them, so I was drawing and painting what they might look like, and I guess I exaggerated a little! One of the students made a Monet's garden scene on her chair, while another did a church hymns theme, and another did aliens. One was about the artist's private space: her laundry room! This backyard lilypond chair was made by Jan Hunsche of Oxford, OH. Using books for technical illustration details, she put a frog, turtle, and many plants on the piece. Jan worked on her exquisite details for long, long hours on this chair, as did many of the students, working late into the night. This was the first year we had enough non-commuter students and students totally engulfed in this project to stay in the studio til after midnight over and over! CraftSummer classes are usually loaded with people who have to get home to families, but this time was different. And so we stayed, too! It was a riot of record playing, dancing, and gossiping! Very much fun! And very committed hard work, in order to get such a project really finished in five days. We had our painting of Dad's Chair in the faculty show at CraftSummer. It's a big piece made earlier this year after Daddy died. We hadn't wanted to have to drive one of our real 3-D chairs down to the gallery, so we sent our stitched painting of a chair. (We're standing in front of it here.) Ain't that sneaky? Top marks for being extra clever artists, avoiding massive freight shipping charges for exhibitions! 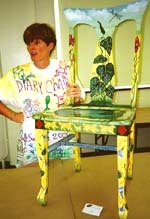 Next year for CraftSummer, we're teaching Diary Painted FURNITURE. People can work on a table, box, shelves, chair, whatever. I think we're doing a silverware box for that year's faculty show, and making sure it'll fit into a nice UPS approved size cardboard box! Then, when we actually teach, we can work on whatever piece of furniture fits into our Trooper. Miss Issie was so pleased to get her friends together for this project! She's quite the art socialite, besides being a great artist herself! She can be counted on to introduce you to people from all over the place she thinks you'll like! Here she models the vintage apron I found her, finally, for her late birthday present. Her birthday was January 28! It's the Southern Belle apron. Fitting for our sweet Issie the Charmer, doncha think? Hattie and Kerris sat around and told secrets and exchanged Tarot opinions a lot. Here they are on the patio, where they both seem to prefer hanging out, rather than being cooped up in the basement studios! It's right by the garden and very inspiring, when the weather's right. And that week, as all summer, the weather really was right! At night we always turn on our patio owl lights and just hang out, letting the good times roll! Since camp, Kerris has set up a studio away from his home and is preparing to teach Tarot workshops there, as well as making his art. 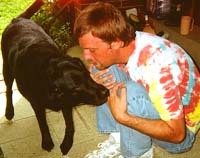 He was a bead artist long before learning sewing and painting on fabric techniques. Speaking of St. Quilta, here's an order finally finished for Rachel Roggel of Israel, with St. Q blessing Rachel and Amiri's wedding in 1978. It's kinda surreal, since it includes their teenage children now, as little angels in the bottom corners! 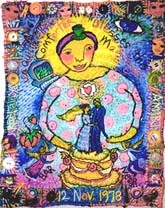 St Quilta's muu-muu is adorned with big pink buttons, instead of her usual gawdy flowers, in honor of Rachel's own quilts, which are covered with buttons. On July 30, we headed to Fitton Center for the Creative Arts in Hamilton, OH, north of Cincinnati, with Gretchen and Mike along, and attended the opening of our solo show there, as well as a show of our students' work. 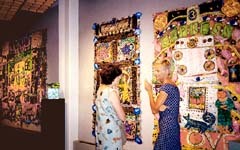 In this picture are Karen Saunders and Carla Copens, two of our "repeater" students at CraftSummer of Miami U. 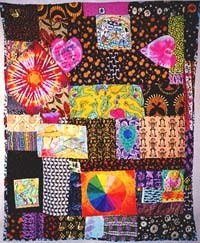 The three quilts here are, from left, "Tropical New York," "Home Sweet Home," and "The Stove / Empress." 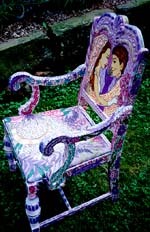 There were over 25 quilts of ours and the large stuffed rocker "Mom's Chair" in the exhibition. Student work was mostly from the SW Ohio area, though some were from other parts of Ohio, as well as out of state. Gretchen hadn't been to one of our big show openings for a long time, and it was a first for Mike, so we were really pleased to have Fitton be the one they came to. And it was the nicest solo display of our work we've seen in a long time! Such a gorgeous building, and the lighting was very dramatic! With all those students in attendance, it was like a nice family reunion or even a love fest! Many thanks to Cathy Mayhugh, who curated our show and also hung it! There were several pieces in this solo show, that we hadn't ever shown before. One was our perpetual Anniversary Quilt, left, which is always in the making. Every year I add something new to it for Jimmy, for our anniversary. Since we use it on our bed, it often tells me where to work on it, with fabrics wearing out from use and washing. It's the only quilt we have now that we've made and actually use on a bed, and I like that! Until this show, we'd never seen this quilt up on a wall vertical!!! Finally measured it, too: 92"h x 81"w. It's all originally machine pieced, which is very rare for us, but I do a lot of hand work on it, as I sew new panels on top of the base quilt. 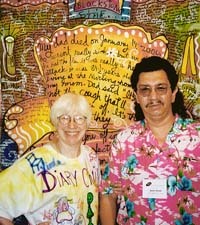 I began it in 1993, when we were teaching at Cleveland Institute of Art, as a third anniversary present. 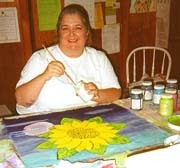 It includes some Lunn panels and some of my own paintings, as well as appliqued panels I've done and my own humble tie dyes. Jimmy's worked on it a little, too. 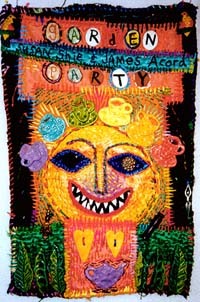 This "Garden Party Sign" was made mostly in 1996 for our solo show "Garden Party," but we added more stitching to it this year, before the Fitton show. The quiltlet is only 17"h x 11"w, and has a lot of the small ceramic pieces on it, that I was making in my little Aamaco kiln, up until we started this web site and I lost my clay time! I need to replenish my clay "fonts" of lettering and my little teapots and teacups, etc. I have done some polymer clay stuff in the last couple of years, but I like the finished feel and look of real clay a lot better. Or maybe it's just good to have both as choices. Anyhow, this quiltlet is a portrait of a scary-toothed Doris the Scarecrow, or was it Ruth, Doris' mother? On August 4, which would have been my father's 85th birthday, we went to The Snyder Ice Cream Supper, over near Orrville, at my cousins Carolyn and Elmer Baer's big dairy farm. Here's our nephew Jacob, aka Blue Boy (note the fading blue elegance of his hair, which we hope he re-blues before Gretchen's wedding!) 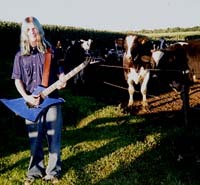 Jake had decided to serenade the cows and stears and bull at Carolyn and Elmer's, rocking out with his cool new electric jobbie. Hey, they REALLY liked it! They came from far and wide in the fields, and they just stood there and listened to him singing to them! They seemed pretty enamoured, actuallly! I was getting a little nervous, having realized these weren't all cows! Hey, these cattle are used to the family sons' Christian Rock, after all, and what if they don't dig Jacob's special rendition of "Time in a Bottle?" Well, no one was injured at the Cow Concert, and the ice cream supper went off without a hitch. Omari got passed all around and met a few little cousins his own age. It was great! We've had this family party every summer since I was a little girl, and even though I don't eat desserts now, it was still very enjoyable. Uncles Bud and Lester still crank out some pretty mean ice cream, with Aunts Mary Jo, Pauline, and Nellie's hand mixed concoctions. And I got to see my cousin Ellen, on her way back to Venezuela! Go to page two of this month's diary.